Just back from Pisa (it has a tower that leans) and Lucca, wherein I got lost, in a car, in streets that grew ever narrower, until it was just me and this tiny wee old woman in a red oilskin...or am I thinking about somewhere else? Anyway, here's a thing: Glen Grant Five Year Old, a delicious if undemanding malt, yours for 10 Eurotokens per bottle here in Italy. 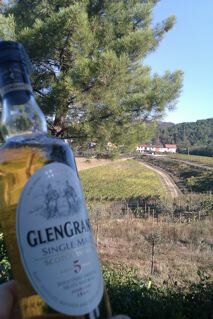 A good breakfast dram! Sold on eBay, my last motorbike. Today was my final powered ride, 35 gruesomely cold, wet and windy miles from Hillswick to Lerwick so I could check the bike in as freight for Aberdeen. Tomorrow, all being well, a man called Gordon will ride away on the old Suzuki GS1000G. It will be out of my life. I've said this before, of course. But with a new Surly Long Haul Trucker touring pushbike arriving tomorrow, I can't afford any more motorised two wheel indulgences. Big acoustic motorbike tours (cf Luka Bloom) loom next year. And besides, I've had enough. Enough of the fear, the cramped fingers, the wetness and cold, the discomfort. The fear. Terror compounded by the inability to see anything through that useless condensation-prone AGV helmet, the most expensively hopeless I've ever owned. I've been lucky. No motorbike-related breakages, no serious harm in the, ah, 40-odd years I've been riding the things. If you count that Vespa I had at 14. But last year's epic 3000-mile plus Ireland, England, Wales and Scotland tour saw my first spill (static in a car park). And the sheer awfulness of high-speed motorway dodgems on the M6 would put anyone off. 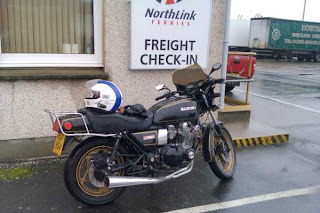 2011 was the year of four motorbikes for me: The beautiful Moto Guzzi Bellagio, two old Kawasaki GT550s, and the Suzuki, three years in and out of the shed. but mostly in. And now there are none. All gone through eBay and Shetlink. Stop. Time to start pedalling. Overweight and unfit, I bought a treadmill. This wasn't difficult, as there are always second-hand treadmills and exercise bikes for sale. One wee 'wanted' ad on Shetlink snagged a Reebok motorised Thighripper Mk 2, and for the last fortnight I've been using it every morning. Almost. I've always been heartily opposed to the idea of gyms and indoor exercise equipment. There's something so inherently ridiculous about running to stand still. But then I read REAMDE, the vast new novel by Neal Stephenson (patchy, ill-disciplined, ragged but with brilliant bits) which introduced me to the notion of 'nerd fitness'. This centres on the fact that you can combine walking/running on a treadmill, climbing on a Stairmaster or spinning on an exercise bike with computer gaming, TV watching or reading. Intellectual and cultural stimulation AND physical exercise. Whatever the weather. I could become a fully rounded human being, albeit lacking in fresh air and UV (unless you get a sunlamp). As opposed to just full. And round. So far so good. Half an hour in the morning seems to activate me for the day. And I've combined some muscle-straining with, let's see, a few episodes of Spiral, two Andrea Camilleri books, Simon Ings' The Weight of Numbers and a re-read of The Cruiskeen Lawn. But then today, I went cycling. Now, I don't just love cycling. I love bikes. In fact, I love bikes more than cycling. Looking at them. Repairing them. Thinking about them. And particularly buying them. I have...let's just say several. With another on the way. And a few weeks ago (see below) I completed the first Shetland Sportive. 40 miles. At my age. I came last. But at least I finished the course. Well, it was the only way to get a free fish supper. I thought today's seven-mile jaunt to Ollaberry (to collect a car from the garage there) would be easy. I was treadmilled up! I had been exercising like a proper gymrat! I was wearing a tracksuit and using SPD cleats! It got better. Then I was there. Then I was home, consuming cheese-and-bacon toasties and home-roasted coffee. And pondering: Exercise, it seems, is non-transferable. Indoor doesn't work outdoors. Reading on a treadmill won't cut it when it comes to real hills on a real bicycle. But then, that's reality for you. Probably overrated.